Like any filter practice, controlled drainage is just one tool that can help solve regional water quality problems. It’s not a silver bullet, especially with some geographic limitations since they can be used only on low-sloping fields. 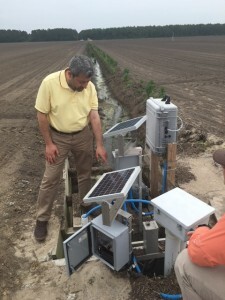 While there is no perfect solution to stop farm runoff, after seeing drainage systems first-hand, I too believe we’re nearing a tipping point for widespread adoption of controlled drainage in agriculture – and big environmental benefits. Here’s the story. The best way to reduce nitrogen loss and improve water quality is for farmers to implement a three-pronged approach: improve fertilizer management, plant cover crops and utilize practices that trap and filter nutrients at the edge of farm fields. Controlled drainage is one kind of nutrient-trapping practice that is a very effective way to limit the amount of nitrogen leaving fields, making farms more resilient to drought and boosting yields. The practice works by installing “gates” at the outlets of drainage pipes and ditches that can be opened or closed by the farmer to manage the flow of nutrient-rich water from farm fields. The ability to hold water in drains and ditches keeps both moisture and nutrients in the soil where they are available to crops. In contrast, growers have the ability to release more water during a wet season to avoid flooding their fields. In eastern North Carolina, the ability to control water and nutrients in the field has been shown to boost corn yields by 10 percent. Reducing the amount of nitrogen leaving the field means less air and water pollution. With all these benefits, controlled drainage sounds like a no-brainer. However, many farmers are hesitant to install controlled drainage systems, in large part because they experienced numerous challenges with early versions of the structures. Earlier versions required farmers to slide cumbersome wooden boards in and out of the control structures on their ditches. Doing so was time intensive, as growers had to remove them manually, and worse still the boards swelled, got stuck and were impossible to remove without a chainsaw. “After dealing with swollen shut drainage ditches, many farmers said their first experience with the practice would also be their last,” noted Youssef. The system consists of modern composite or aluminum boards that don’t swell. 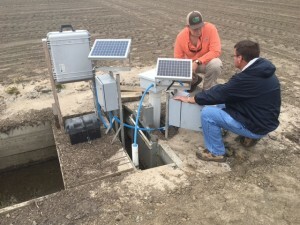 New “smart” drainage systems under development send farmers notifications for when they should raise and lower the boards based on the weather forecast, soil moisture and growth stage of the crop; this offers huge time-savings. Completely automated systems now raise and lower on their own. There are opportunities to recycle drainage water to re-irrigate the fields – a benefit to the environment and farmers’ cost-savings. Structures are changing, thanks to technology improvements and new funding opportunities to install controlled drainage structures, including a new U.S. Department of Agriculture grant. 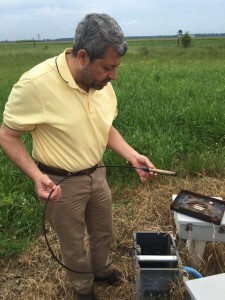 To make controlled drainage systems widespread, Dr. Youssef suggests disseminating more information through the Natural Resources Conservation Service, grower trade associations and groups, and environmental organizations like EDF. This entry was posted in fertilizer, Sustainable Agriculture and tagged agriculture, controlled drainage, cover crops, environmental defense fund, farm, farming, fertilizer efficiency, fertilizer management, irrigation, Natural Resources Conservation Service, NC State, new technology, nitrogen, nitrogen surplus, North Carolina, nutrient management, runoff, sustainable agriculture, U.S. Department of Agriculture, USDA, water pollution, water quality. Bookmark the permalink. Both comments and trackbacks are currently closed. I can agree that farmers should try to control the drainage from their fields. Like you said, it will help them keep the water they want and get rid of the excess keeping their plants healthier. This coupled with reducing nitrogen pollution just cements the idea in my mind. This is technology that I hope improves enough to become widely used.